On-going weekly classes and individually scheduled seminars are available in Placerville, CA. 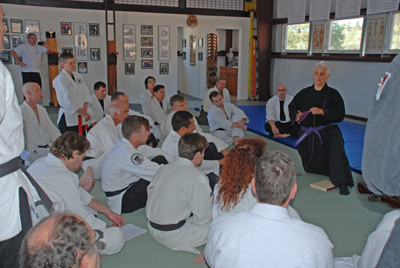 These intimate classes provide personal one-on-one or small group instruction with Shihan Masi. The experienced martial artist will receive the greatest benefit from these lessons. Lessons in Hakko Densho Ryu Jujutsu, Iaido, and Hojojutsu are open to martial artists of all systems and all rank levels. No previous experience is required. If you are interested in joining these classes or wish to schedule a seminar at a location of your choice, please contact us for more information.